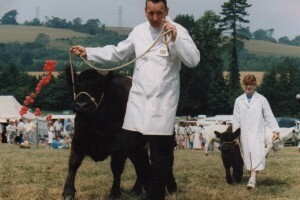 At the Singleton Show for Rare and Traditional Breeds in Sussex, 1990. John is leading Maggie and Natalie is leading Bubby, our Belties (Belted Galloway cattle – you can’t really see the “belts” in this picture though). The Farm took 4th place that day.